I’ve seen it for years; people wandering aimlessly around their fitness center’s weight room (a.k.a. conditioning area, strength area) clueless as to where to begin. I’ve come to the conclusion that despite their good intentions, they just don’t know what they are suppose to do or how to do it. I can understand why. With so many machines, the fitness center’s atmosphere can be intimidating! Wouldn’t you like to have the confidence to walk in to any fitness center and put together a workout? I’ve devised a simple plan for seeking out the equipment you need for quick, efficient, total body workout. To clarify, this plan is for the average Joe or Jane who wants a simple strength training (a.k.a. resistance training) workout that incorporates their fitness center’s machine-based strength equipment. This plan meets the guidelines (view here) set by fitness industry. Warm up using cardiovascular equipment. Locate your center’s cardiovascular equipment. Examples include ellipticals, treadmills, stair climbers, steppers, rowers, recumbent bikes, and upright bikes. Choose one of these machines and use it (ask for assistance if necessary) for 10-15 minutes. Start slowly and increase the speed and/or resistance until your body begins to perspire. This warm up should get your blood flowing, help lubricate your joints and provide kinesthetic awareness. Most people tend to skip this part of a workout, but know that it can possibly prevent injury. Find the machine-based strength equipment. Once you have completed your warm up, our focus will be the machine-based strength training equipment. Don’t be overwhelmed by all the choices. You’ll soon learn that you don’t need to use every piece of equipment in your fitness center to complete your workout. Again, this is a machine-based workout. No need to concern yourself with the barbells or dumbbells. 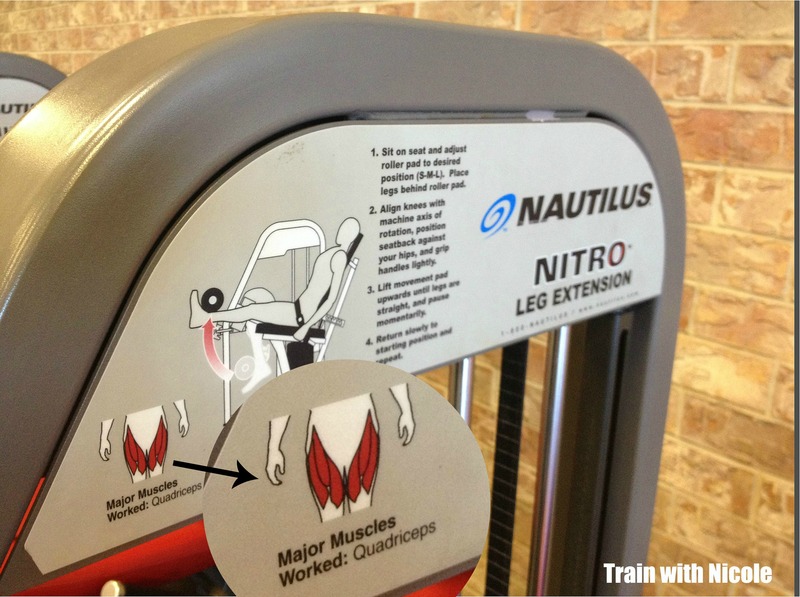 Locate one machine that works the quadricep muscles and perform 12 repetitions of the exercise. See photos below for examples. The pictures on the machines will help. Taking the time to read through the instructions will ensure that you execute the movement properly. Yes, you might look weird reading the instructions, but not as weird as you will look if you are performing the exercise incorrectly! Keep in mind there may be additional adjustments–like seat height or leg pads–to be made on each machine. Ask for help from a staff member, if necessary. At this point, you should be ready to use the machine. Select the lightest weight and execute the movement a few times. Now, determine the amount of weight that you can execute for 12 repetitions. Select it and begin. You should be able reach muscle fatigue (the point where you cannot complete another rep) by the last repetition. If not, know that you’ll have to increase your weight for the next set. Your tempo should be slow and controlled, not fast and jerky. After completeing 12 repetitions, this is considered 1 set. 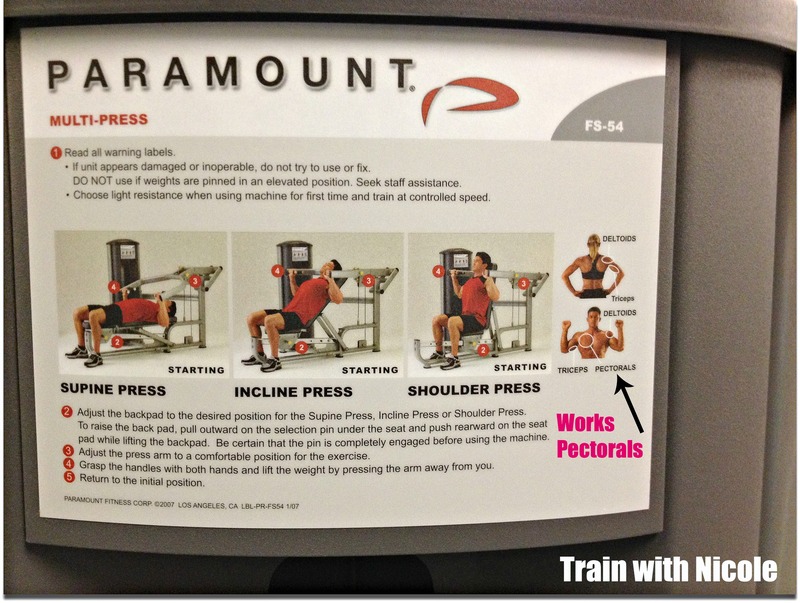 Locate one machine that works the chest (pectoral) muscles and perform 12 repetitions of the exercise. Locate one machine that works the upper back muscles and perform 12 repetitions of the exercise. Locate one machine that works the biceps and perform 12 repetitions of the exercise. 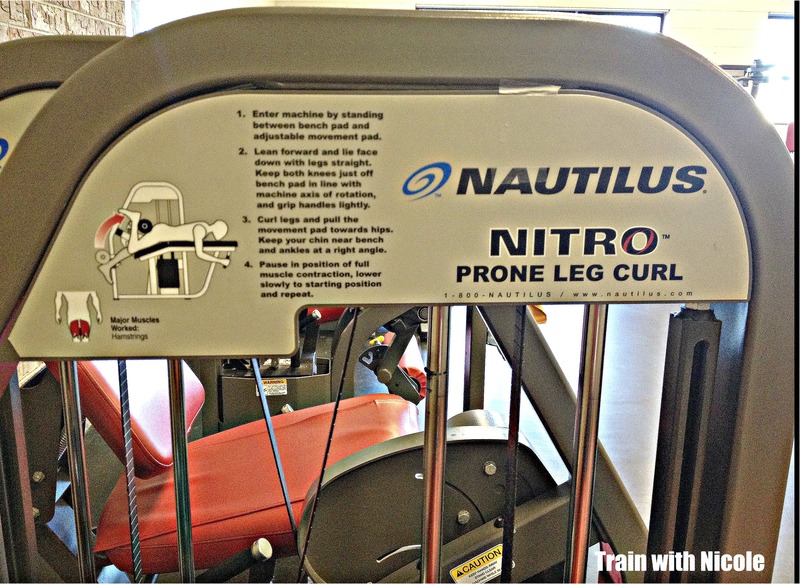 Locate one machine that works the triceps and perform 12 repetitions of the exercise. Locate one machine that works the abdominal region and perform 12 repetitions of the exercise. Locate one machine that works the low back region and perform 12 repetitions of the exercise. Repeat this entire sequence one to two more times. Once complete, spend 10-15 minutes stretching the muscles you worked. I provided you with a simple plan for a total body workout using machine-based strength equipment. However, there are a few things you should keep in mind when strength training. Work to achieve muscle balance. For example, if you work one side of the legs (the back side – hamstrings) you need to work the opposite side (the front side – quadriceps). This holds true for all muscle groups. Typically there are a many machines that focus on the same muscle group. You only need to choose one! During your next visit, pick a different machine for variety. This strength training format requires you to move from machine to machine with the idea that one muscle group can be working while another muscle groups rests. Moving from machine to machine, in a circuit, allows you to complete your workout in a shorter amount of time. Instead of sitting on a piece of equipment and resting between sets (also know as ‘hogging the equipment’) you will keep moving through the entire sequence of exercises. If someone is on the machine that you want to use, get over it. Either find another machine that works the same muscle group and use it or return to it later when it is available. Don’t worry about the order of the exercises. Instead, focus on completing two to three sets for all the major muscle groups. Strive to complete a total body strength workout two times a week, ideally with a day of rest in between. As a courtesy to those in the fitness center remember to wipe down/sanitize the machines after use. Navigating through a fitness center’s weight room can be intimidating, but doesn’t need to be. Seek out one strength-based machine for each muscle group. After completing one set of 12 repetitions, move to another machine. Continue until two to three circuits have been completed. Complete a total body workout at least twice a week with a day of rest in between. I hope this plan allows you to navigate your fitness center’s machines more confidently.